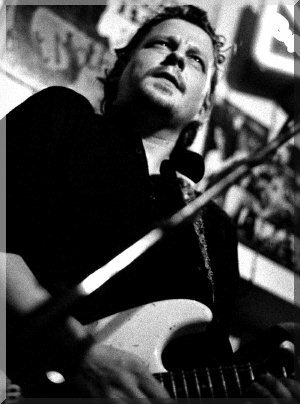 Well known on the blues scene in the north of England and in outside London, Ian Siegal has a large and loyal following. A master of the post-war Chicago style, he also plays a lot of very strong original material. Ian taught himself to play from the age of 18; mostly listening to Muddy Waters, the Kings, Robert Johnson and Robert Cray, and when he was 19 he ended up in Berlin busking for a living ("nothing wrong with that" - webmaster). Ian later became the original singer for Lee Sankey's band. However.This excellent singer, songwriter and guitarist covers more genres than straight blues, and Ian cites his main influence as Muddy Wayers, followed by Howlin' Wolf, Tom Waits and Little Richard! There are also shades of Willie Nelson, Son House (in preaching mode) and flavourings from Chicago to New Orleans in his performances; all seasoned with sheer enthusiasm and a unique style of delivery. One of Ian's earliest recordings was a "Cassette only" release, "Live At The Navigation Waterfront" (Newark, April 1996), on which he was accompanied on some tracks by a young lad called Aynsley Lister on guitar! Since then Ian's released many acclaimed albums, and on The Ian Siegal Band's 1999 release "Yo' edjumikashun" Dino Baptiste, Lee Sankey and Matt Schofield also appeared. Ian also likes to perform solo acoustic work enable him to stay in touch with core roots and also to work-up new material, and Ian has released an excellent solo album "Hard As.."
"Ian Siegal is one of my favourite singers and guitarists, and one of the best performers in Britain".